REGALO PARA MIS SUSCRIPTORES, SEGUIDORES Y DE MAS GENTE QUE APRECIA MI TRABAJO EN LA WEB, AQUI ESTA UN PACK QUE A MI PARECER LES VA A GUSTAR, ES UN PROYECTO CONSTRUIDO EN AUTOPLAY. 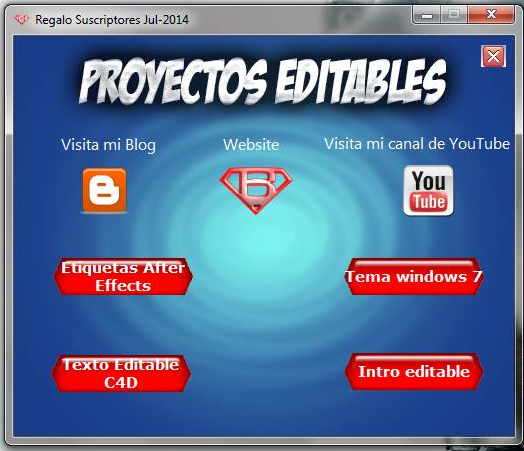 SON PLANTILLAS EDITABLES COMO PUEDES OBSERVAR PARA PERSONALIZAR TU CANAL SI ERES YOUTUBER, TAMIBEN INCLUYO UN TEMA MUY PEDIDO PARA WINDOWS 7. TODO ES GRATIS EN MI WEB EL REGALO TAMBIEN, DISFRUTENLO Y GRACIAS A TODOS! !